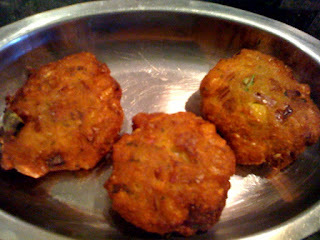 I made this vada last week for evening snack. It came out pretty good and the girls liked it. It a perfect evening snack for kids and rich in protein. Here goes the recipe. Soak channa dhall for couple of hours along with the chillies. When you are ready to grind, thaw the frozen corn and microwave it for 3 minutes. Let it cool. Now take the soaked channa dhall, MW corn leaving couple of teaspoons for later, chillies & hing and grind it coarsely without adding water. Take it in a bowl, add the remaining corn, curry leaves, salt, fennel seeds and mix everything well. Take a wide bottomed pan, heat oil. Make small patties of the grounded batter and deep fry it till it becomes golden brown. Serve it hot with a chutney or ketchup. I made this rice today. I had few small cubes of pineapple pieces which nobody wan to eat. I am not a big fan of pineapple either. I eat it sometimes with bread as pineapple sandwich. Today i was not in a mood for sandwich. Didn't want to throw the fresh looking pineapple in trash. I was planning to make variety rice today. Idea of making this pineapple rice came in the middle of cooking. Surprisingly, it tastes really good. Here goes the recipe. Wash basmati rice and soak it for 10 minutes. In the mean time, roast the ingredients given for grinding, to golden brown. Let it cool and grind it as a powder. Take a pan, preheat oil/butter, fry cumin seeds, add green chillies and fry it for a second. Now add the thinly shredded onion & turmeric powder. Saute for few minutes. 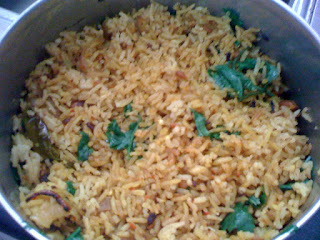 Drain the basmati rice, add it to the frying ingredients and saute for few seconds. Add everything in a vessel. Pour 1 cup of pinepple juice and 1/2 cup water. Add required amount of salt. Also add 1 or 2 tsp (acc to taste) grounded masala powder. Mix it well. 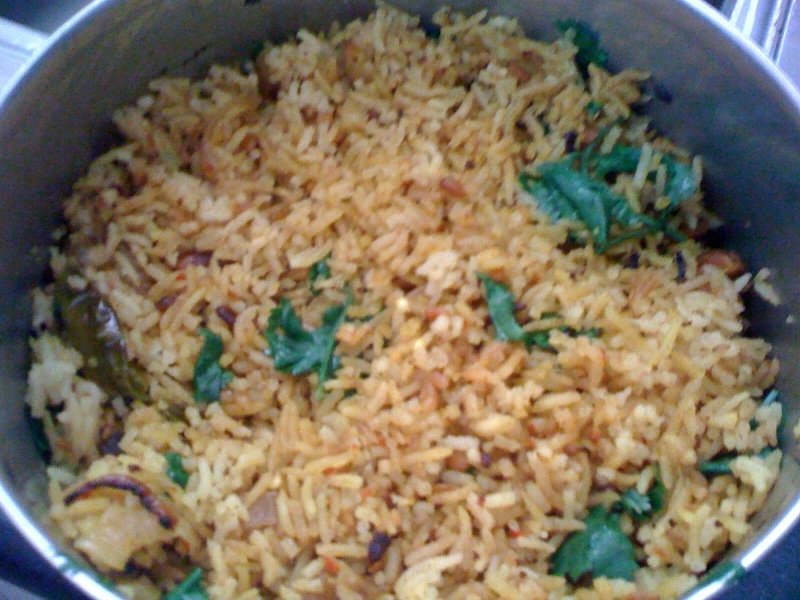 Cook it in a rice cooker till it is fully cooked or a pressure cooker upto one whistle. 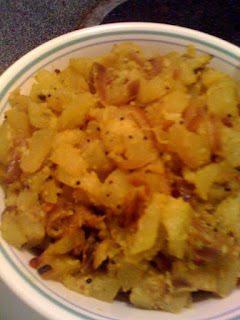 Serve it hot with raita & chips or with potato curry & chips. You will never get the sweetness of pineapple because of the masala powder. P.S. - It was little spicy with the amount of chillies used. We can always reduce the quantity of chillies. When it comes to weird combinations of side dishes, no body can beat our very own Hotel Saravana Bhavan. We attended a baby shower function last month and the host ordered food from HSB. This was the side dish in the menu. First I thought this was snake gourd curry but then one of our friend's mom said its bottle gourd. In our family, people never use this bottle gourd for cooking. I came to know about the goodness of this vegetable when we were in Delhi for one year. I started using this bottle gourd in my cooking atleast couple of times a month. This time, after seeing this very new side dish, immediately I wanted to try this at home. Here goes the recipe. Chop bottle gourd into a bite sized pieces. Take a pan, pre heat oil, splutter mustard seeds, fry urad dhall, red chilly & hing. Now saute' chopped onion to golden brown. Add the chopped bottle gourd to it, add turmeric powder, required amount of salt and sprinkle hand full of water to it and cover it with a lid for 5 minutes. Now grind coconut, green chillies & cumin seeds together without adding water. Keep it aside. Check the bottle gourd in between because it takes very less time to cook. When its 3/4th done, now add the grounded coconut mix. Mix evenly and let it cook for another 3 minutes in low flame. When the raw smell of green chilly goes away, turn off the stove. Garnish it with curry leaves. Serve it hot.